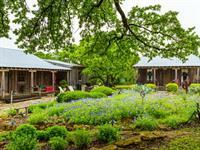 Think B&B, Think Wedding Venue, Think the Texas Hill Country Dream waiting for you! Here is the perfect chance to own an authentic Texas farmhouse with a detached guest house on 22+/- idyllic acres very close to Boerne. 2600 sf home of cypress board/batten *all Texas native woods* wide plank floors* vaulted cypress ceiling* stone fireplace* 6 burner gas cooktop * Subzero refrigerator * 2 masters flank each end of home* 3rd bedroom in guest house* separate study* library/TV room* climate controlled wine room* 3500 sf. Herb, flower garden, terraced and drip irrigation * 4-6 stall barn with apartment. Ag-Exempt. Beautiful Luxury Home in The Ridge of Tapatio with VIEWS!! !